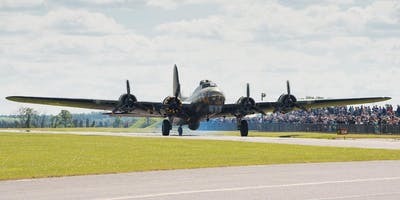 ANNOUNCEMENT: Due to engine failure, the B-17G “Aluminium Overcast” plane will NOT be in attendance at Airport Day 2018. We apologize for the inconvenience. But there are many other fun activities planned! See below for details. Airport Day is a fun family-friendly event, hosted at the Ithaca Tompkins Regional Airport. Please register all attendees for the Airport Day on this page. Registering here will allow our staff and volunteers to better prepare for your arrival and keep you updated with any changes to the event. You will NOT need to bring your registration ticket to gain entry. The Fall Harvest Breakfast provided by the East Hill Flying Club. Discover aviation with the East Hill Flying Club. The 1-hour “Runway 5K” race that actually occurs on the runway. 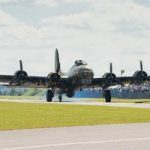 Flight experiences and tours with the famous B-17G Flying Fortress. Static displays and people to answer questions about the SPCA, Upstate New York Car Club, Porsche of Syracuse, and more (complete list below). The breakfast brings people in the community together for a savory meal with New Hope Mills Pancakes, accompanied by real New York State maple syrup, eggs, sausage and more. The breakfast is all-you-can-eat dining for $8 (or $7 if you arrive before 9:00 AM). 5K runners are strongly encouraged to pre-register at so your race packet will be ready for your arrival. Registering on this page will help us prepare for other activities at Airport Day. The UNYCC will have several vehicles on display from various car brands, and members will be around to answer your questions about the cars and club.